As of September 5, 2018, the Radiant Earth Foundation replaces Radiant.Earth, strengthening our non-profit identity, lessening any brand confusion that may exist, and removing that awkward “.” between Radiant and Earth. With this small but important name change, the Radiant Earth Foundation looks forward to continuing its important work on behalf of the global development community, bridging commercial, government, academic and non-profit sectors for improved contributions and benefits. Founded in 2016, Radiant Earth Foundation is a non-profit organization committed to aggregating the world’s open Earth imagery and providing access and education on its use to the global development community. Through its open platform, Radiant Earth Foundation allows people to search, discover, and analyze millions of ongoing collection of satellite, aerial and drone data on the cloud—instantly, securely and for free. 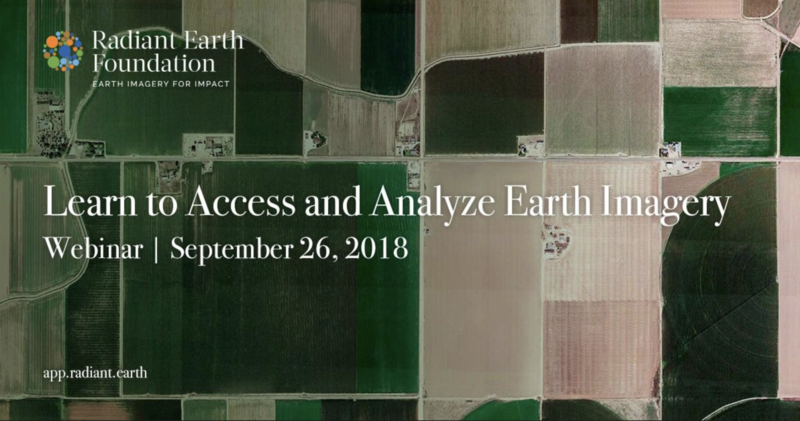 Radiant Earth Foundation is hosting a webinar on 26 September 2018 at 5:00 PM CEST: Learn how to Access and Analyze Earth Observation Imagery: An open platform for global development by Radiant Earth Foundation. The webinar will include a demonstration of the platform’s capabilities and a Q&A session.